No matter how hard you try to describe this amazing country with the best adjectives, the words will always lack something. Brazil is the country of rhythm, the vivid colors, the most exquisite example of nature, football, soap operas and much more. 5th biggest country in the world, ranks the first at being the largest in South America. With a population of 193 million, Brazil is the rising star of economy with its place on the 7th row in 2013. The capital Brasília (no, it is not Sao Paulo or Rio de Janeiro) holds 2.5 million of the total population. There are five regions in the country, all of which are filled with natural treasures or metropolitan attractions that you’ll not be able to take off your mind even after long time you got back home. The most famous of these is probably the Southeast of the country as it is home to Rio de Janeiro and Sao Paulo, the most famous cities in Brazil. Although tropical savanna is considered to be the general climate of Brazil, as it is a massive country the weather changes from region to region. However, if you travel in the right time of your desired area, Brazil will welcome you with the shiniest sun ever. You probably know about the Amazons, but Brazil has also got the Atlantic Forest, Pantanal, one of the world’s largest wetlands, and one of a kind waterfalls that amaze the one who sees them. These are exactly the reasons why travelers choose to leave the metropolitans after they stay for a week. The hug of nature is not tighter in any part of the world than it is in Brazil. Think of a country that turns into a huge party at the carnival times, where the soul of the city dances with its locals. These are the two things that shape up the happy and passionate characteristic of Brazil. If we also consider the amazing coasts, natural wonders, delicious cuisine and the richest of the cultural heritage, then we can clearly see why Brazil has always been in people’s dreams. Brazil is in South America, neighboring 10 different countries. Brazil is welcoming a lot of travelers every year. If you would like to learn more about the visa regulations, Brazil goverment site for visa provides the needed details. How to get around in Brazil? Brazil is a massive country and there are a lot options if you would like to travel to more than one destination within the country. You may rent a car (Brazil has got the largest road network in Latin America), or you can consider buying Brazil Air Pass. Brazil Air Pass is a way of buying multiple flights, 4 or 9 usually, at a time, for a considerably better price. You can use the flights to any destination at any time desired. Keep in mind, Brazil is not the best country to travel by train. You know, it is really hard to give suggestions on the attractions of Brazil as the country itself is an attractions. However, having a general idea of the things that are waiting for you in advance may be a good idea to plan your trip. If you are planning to begin your trip in a big city of Brazil, such as Rio de Janeiro, Sao Paulo, Salvador or Brasília then you will see how lively, energetic and excited a city life can get. All these cities offer various attractions that range from sightseeing to rich museums, beaches and an amazing night life. Your notion of time may get lost as you try to keep up with everything in the city. Actually, you don’t have to have a special interest in nature to get fascinated by the treasures Brazil has got. The wilderness that is still as scary as it can get, the sort of forests that is home to animals you have only seen in documentaries before, the waterfalls that amazes everyone with the scenery and their power, the aquarium like beaches… These are only a part of what the dream land offers to you. There are many festivals and carnivals throughout the year in Brazil. The most famous of these, as you already know, is Rio Carnival. It takes place between different dates ever year however these usually fall on February or March. Make sure you let your hips do the talking if you come across any of the festivals. Brazilian Cuisine is one of the richest cuisines in the world. Although the ingredients have changed greatly throughout the time, the deliciousness of the dishes remain the same. There are dishes made from root vegetables and sometimes fruits as the land is fortunate in terms of the variety. Everything you order in a restaurant will probably come with some beans on the side. Pork and sea products are used widely in the making of the tasty bites. If you would like to taste some typical Brazilian food you are welcomed to start with Feijoada, pork and bean stew. It is considered to be the national dish in Brazil. If the idea of sea food flavored with coconuts, then Bobò de Camarão is what you should get. Coxinhas is the famous Brazilian snack, it is easy to find everywhere. We should also mention the famous Brazilian coffee. If you are already a coffee addict, then the caffeine level in your blood may exceed the already a lot limit in Brazil. Make sure to taste the national liquor Caipirinha. Sugarcane juice, usually mixed with lemon or pineapple juice, should also be on your list. Due to serving as home for more than 1.5 million Japanese, coming across to pretty tasty Japanese food is also common in Brazil. It is always fun to shop in Brazil. You will notice the prices are comparatively cheaper (of course if we are not talking about Tommy Hilfiger or Burberry) and the quality is surprisingly good. What to buy from Brazil? Well, as long as you avoid electronics and worldwide famous brands, you are good to go. Especially hand-woven Brazilian hammocks are popular among travelers. You will come across different types of souvenirs depending on the region you visit. Jewelry may be a good idea as you will find many different styles, both with precious stones or colored rope. Buying leather shoes or accessories is also a good idea in Brazil. If you come across one of the street markets, don’t hesitate to touch the item you’d like to buy, try it, it is okay in Brazil. Again, don’t go for the brands in those markets, you’ll probably end up with paying a lot for a pair of fake Gucci’s. 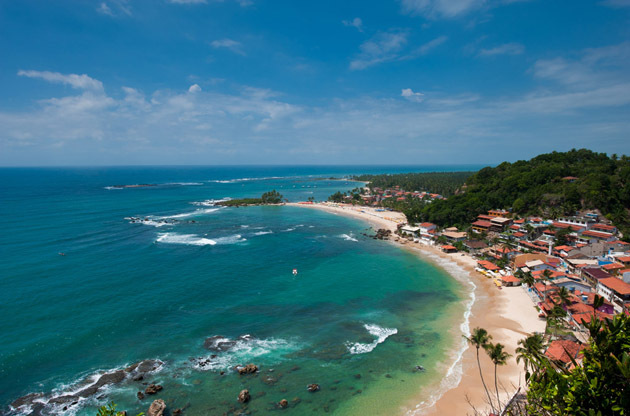 One of the most predominant countries in South America, Brazil is also visited by a large number of event attendees as well as regular tourists. In most of the major cities in the country, especially Sao Paulo and Rio de Janeiro host a large number of tradeshows, fairs, exhibitions, congresses, conferences and symposiums every year. The attendees find the chance to participate in the desired event and enjoy to explore this exotic country at the same time.